We’d love your help. Let us know what’s wrong with this preview of The Viking Anthology by Snorri Sturluson. The Comprehensive Collection of Viking and Norse Literature This vast ebook Anthology is exploding with masterpieces of world literature, ranging from the peerless Icelandic Sagas, to the Norwegian 'Heimskringla', or the 'Chronicle of the Kings of Norway'. 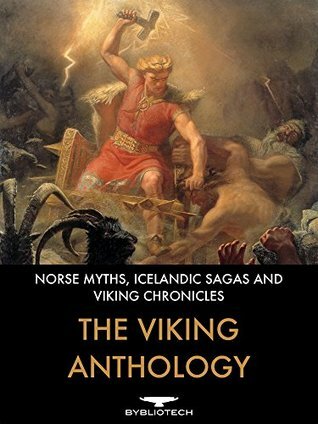 As well as these original texts (in English Translation), are several accompanying great works of scholarship which are an essential companion to the texts - assisting the reader in their understanding of Viking, Norse and Icelandic culture and beliefs - from their complex creation myths, to their huge array of Pagan Gods to rival the pantheons of Ancient Greece or Rome. Anyone with an interest in the rich and fascinating history of the Vikings should invest in this excellent anthology, that compiles huge numbers of work into one incredible resource. The anthology has a full table of contents that responds to every chapter within the numerous different works, and has been carefully edited and formatted to remove any errors from the text. To ask other readers questions about The Viking Anthology, please sign up. This is a great resource and I've enjoyed it immensely over the months. I recommend this to be in the library, at least the digital one, of anyone interested in the Viking era and Norse mythology. The comparative mythology section is very interesting. Snorri Sturluson (also spelled Snorre Sturlason) was an Icelandic historian, poet and politician. He was twice elected lawspeaker at the Icelandic parliament, the Althing. He was the author of the Prose Edda or Younger Edda, which consists of Gylfaginning ("the fooling of Gylfi"), a narrative of Norse mythology, the Skáldskaparmál, a book of poetic language, and the Háttatal, a list of verse forms Snorri Sturluson (also spelled Snorre Sturlason) was an Icelandic historian, poet and politician. He was twice elected lawspeaker at the Icelandic parliament, the Althing. He was the author of the Prose Edda or Younger Edda, which consists of Gylfaginning ("the fooling of Gylfi"), a narrative of Norse mythology, the Skáldskaparmál, a book of poetic language, and the Háttatal, a list of verse forms. He was also the author of the Heimskringla, a history of the Norwegian kings that begins with legendary material in Ynglinga saga and moves through to early medieval Scandinavian history. For stylistic and methodological reasons, Snorri is often taken to be the author of Egils saga.